The Fayette County Chamber of Commerce Ambassadors named Fayette Pharmacy their October Business of the Month. Operating from their new location at 1500 Columbus Ave., pharmacist Rod Banks and staff welcome residents to visit. While their location is new, their dedication to high quality patient care remains the same. The Chamber of Commerce thanked and congratulated the business on their new location and for being a valued member. 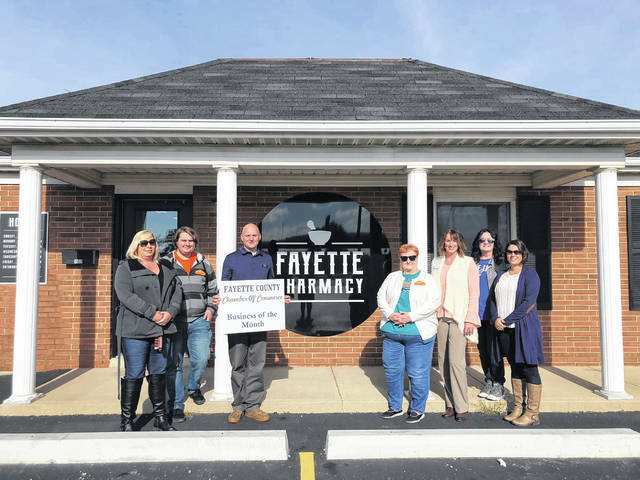 https://www.recordherald.com/wp-content/uploads/sites/27/2018/10/web1_IMG_1249.jpgThe Fayette County Chamber of Commerce Ambassadors named Fayette Pharmacy their October Business of the Month. Operating from their new location at 1500 Columbus Ave., pharmacist Rod Banks and staff welcome residents to visit. While their location is new, their dedication to high quality patient care remains the same. The Chamber of Commerce thanked and congratulated the business on their new location and for being a valued member.